Daily instruction for children and teens ages 6 – 13 (grouped by age) will be offered from 9 a.m. – 4 p.m., with three teaching sessions per day plus two half-hour breaks. Classes will include drawing, painting and ceramics, each taught by professional artists and instructors, with an Art Show on the last day! Students will be grouped by age and abilities, and should bring a lunch, snack and water bottle each day. 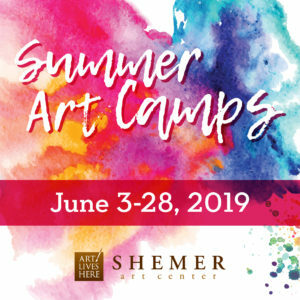 Please be sure to call Shemer Art Center with questions or if you need assistance registering your budding artists!